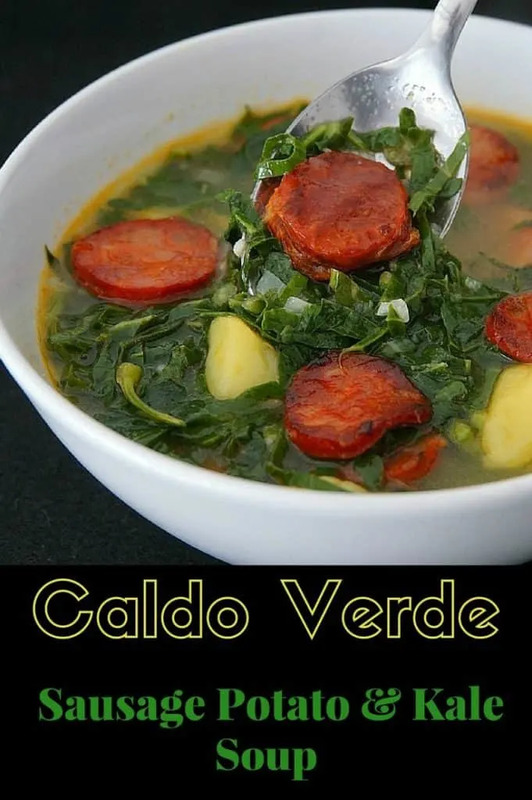 Caldo Verde is a popular Portuguese soup recipe whose name translates simply to “green broth.” The soup gets its characteristic green color from hearty green leafy vegetables in the cabbage family (forms of kale or collard greens are often used). 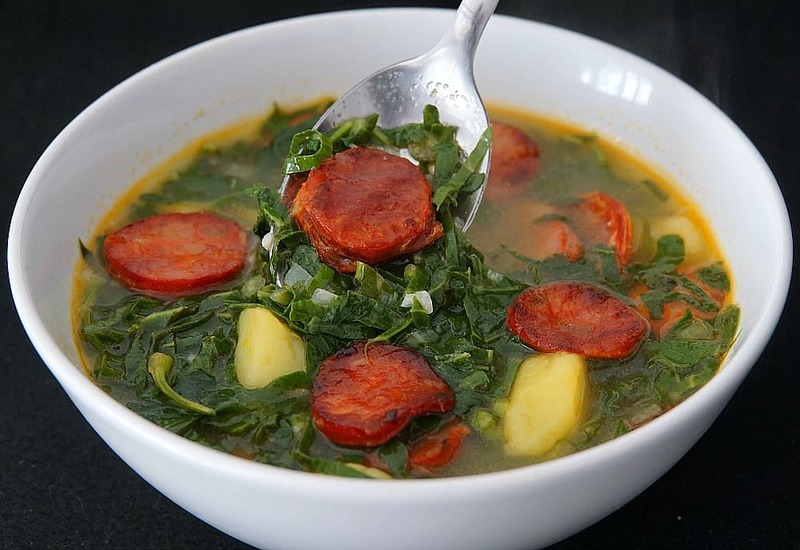 It gets its rich creamy texture from potatoes and a spicy punch from the use of spicy smoked sausage (such as linguií§a). These few simple ingredients come together to make a savory soup that is perfect for a starter, or a full meal when paired with crusty bread for sopping up the rich broth. 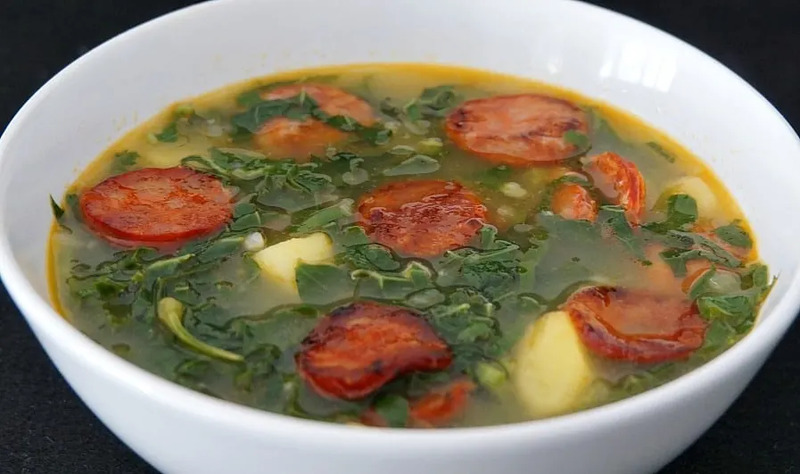 Note: Although there are many variations, In traditional Caldo Verde recipes, the sausage of often added at the end. The spicy smoky sausage is already fully cooked. We suggest that taking the extra step and browning the sausage and using the drippings to cook the onions and garlic adds another dimension of flavor. Other recipes also suggesting using a blender to turn the onions and potatoes until smooth before adding the kale. Our version leaves chunks of potatoes. The choice belongs to the chef. Visit our international Recipes section to see our entire collection of recipes (including a wide range of popular soups) inspired by our travels around the world. Add 2 tablespoons of olive oil to a sauce pan over medium heat. Add the Sausage and cook until they become lightly toasted around the outer edges. Remove from the pan and set aside. Add the potato cubes to the pan and mix. If the potatoes are not completely coated with oil, drizzle with some of the reserved sausage drippings. Cook for 2 minutes. In the mean time, wash the kale or collard greens and remove the hard stems. greens. Working in small batches, cut them julienne style but rolling them a few leaves together lengthwise into a cigar shaped bunches. Shred by cutting crosswise into small sections resembling blades of grass.Â NOTE: if you are concerned about bitterness, add the greens to boiling water for 1-2 minutes, drain into a strainer and rinse with cold water. Return the potatoes to the soup and add the greens and the sausage. Allow to simmer for about 5 minutes. The greens should be bright and slightly crunchy. Season with salt and pepper to taste. Ladle into bowls and drizzle lightly with olive oil (optional). Serve with crusty bread.